We just returned from our first trip of the 2018 season. 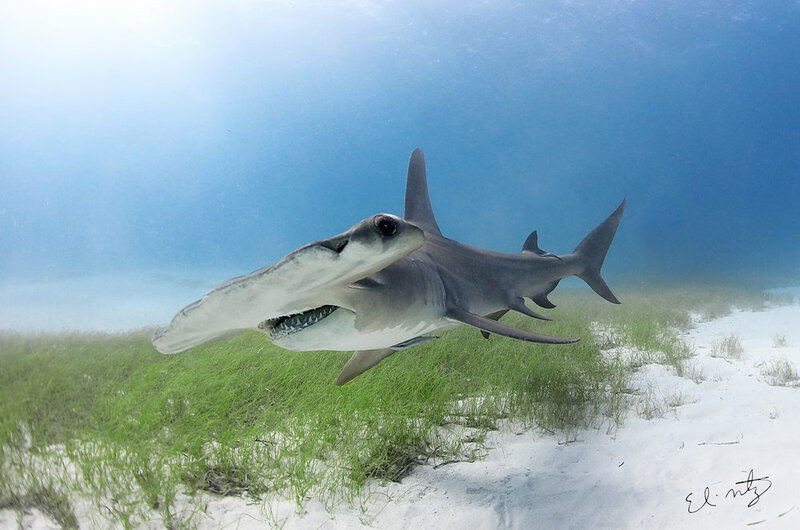 Tiger sharks and great Hammerheads off the Northern Bahamas. It was a good week, a few weather issues, but considering that our first Tiger Beach trip of the 2017 season, we lost the first couple of days to bad weather, this was a better kick off to the new year. We still had wind and some stirred up seas, but we were able to dive everyday, and that is a very good thing. The tigers took a couple of days to arrive, they push so far off of Tiger Beach when there are storms. 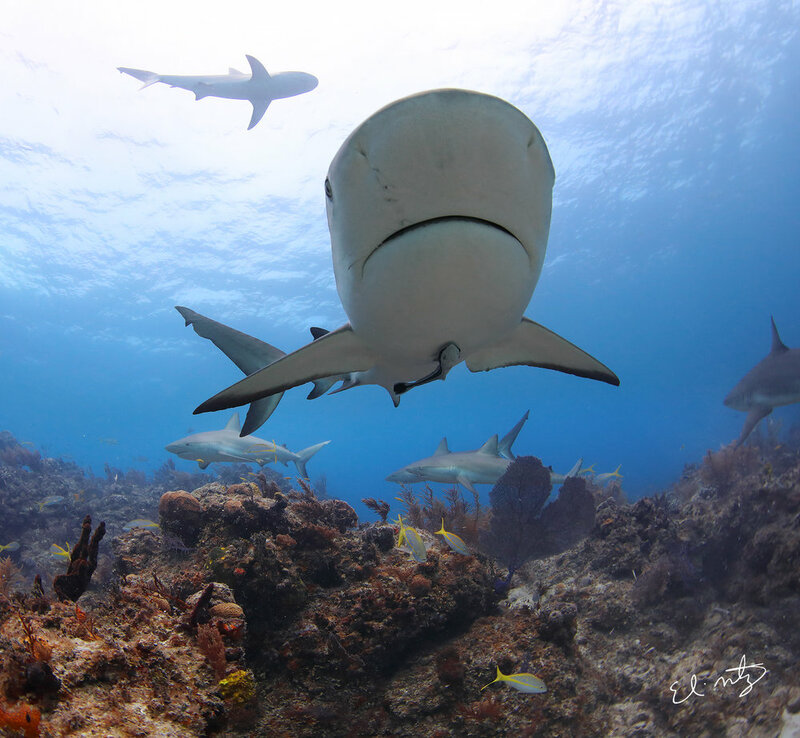 We had plenty of lemon sharks and reef sharks to entertain us, but everyone is here to see the rock stars. My guess is they go hunting in the deep water and stay off the banks, where the water is churned up. They return when the smell of chum hits the currents. When they arrived it was a great feeling, knowing that the tigers are safe. Some jackass came out here to catch a tiger shark for his social media page, a couple of months back. It was a catch and release, but the fact that he came out here just to do that really set me on edge. 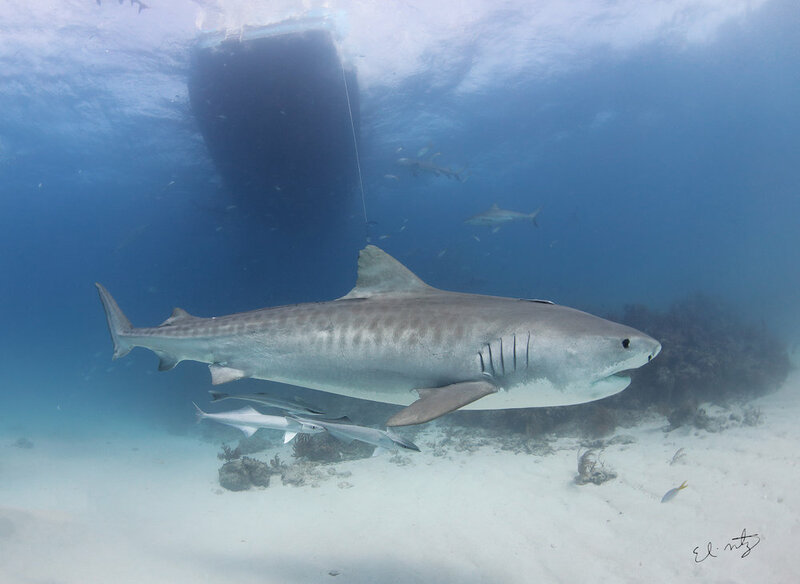 Always worried about our sharks at TB, especially our big tigers, so vulnerable out here. I worry about all the tigers, but especially our TB sweethearts, like Emma, Hook, Tequila and Princess. It kills me to think of them on a fisherman's line. A few days into the trip, our now local great hammerhead, Patches showed up to say hi. She is always fun to have around. 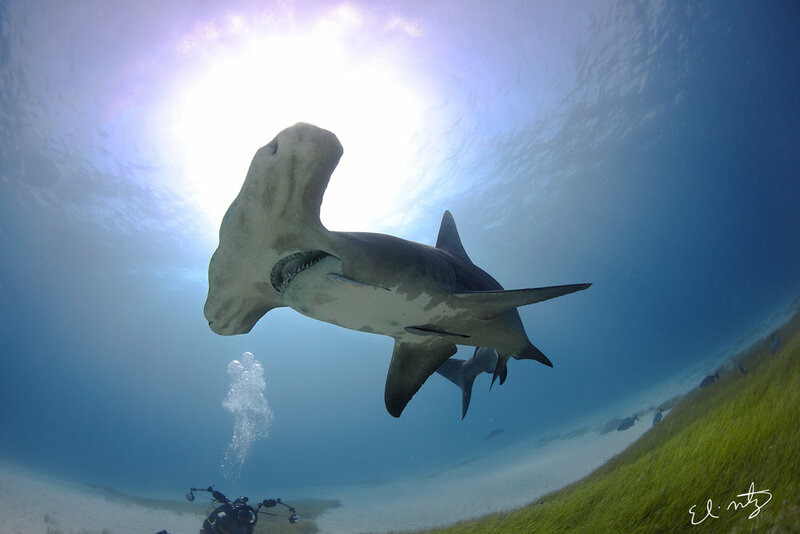 It is always a sight to see, when you have a mix of both tiger sharks and great hammerheads around. She has been super aggressive though, coming in hard and fast on the bait box. I guess it has a lot to do with all these other sharks, always trying to push her away from the box? She has to be bossy, if not, she could not survive being around all the big sharks at this dive site. The big change here is the bull sharks. This season we have seen a rise in bull sharks hanging around the TB dive sites, like never before. They used to be pretty elusive and would stay out in the peripherals. But not anymore. Now they come in and swim close to the divers and close to the bait box. They still do not come up to the bait box…yet. But they are getting close. We of course are going to discourage it. We do not want this to turn into a bull shark feed, we want to keep it tigers and great hammerheads only. Anyway, this was a great start to the season. Toinite we head back out, with a new group of divers for the second trip of our expedition tours. Weather right now is questionable. I know our crossing is going to be terrible. High winds and big swells mean for a rocky-rolly night. More images and reports when we return. If we get signal when I am out there, I will for sure post and share, so check us out on Facebook and Instagram for more updates. Thanks for reading. Newer PostTiger Beach is on Fire! Older PostFinal Trip of the 2017 Season.